Our legal fight to prevent a radioactive disaster at the Diablo Canyon Nuclear Power Plant begins July 11 at 9:30am. Please join us at the courthouse to support our case and view the proceedings; the courthouse is located at 111 N. Hill St., Department 82, in downtown Los Angeles. We’re suing because in 2016, the California State Lands Commission (SLC) gave Pacific Gas and Electric Company (PG&E) a new lease for the tidelands at their nuclear power plant near San Luis Obispo—California’s last nuclear plant in operation. We argued against that lease extension at hearings before the SLC but did not prevail. So, we filed suit on behalf of Central Coast residents because the SLC failed to follow the law, specifically the California Environmental Quality Act, to review the new lease’s impacts. Our suit was filed after the SLC’s June 28, 2016, decision to extend tidewater leases allowing Diablo Canyon to continue operating through 2025. There has never been an Environmental Impact Report done on this aging nuclear plant. That can’t be allowed to stand; we can’t take PG&E at their word that Diablo Canyon is safe. The State of California must be made to provide real oversight and to investigate the potentially catastrophic risks at this site. Remember, PG&E is a convicted felon that chose profits over safety. 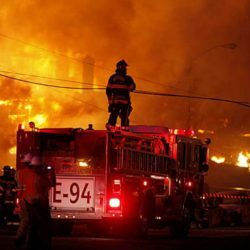 PG&E was convicted in federal court on five felony charges of violating federal pipeline safety regulations and one count of interfering with the investigation into the disastrous 2010 explosion of a natural gas pipeline in San Bruno, California. The explosion and fireball killed eight people and destroyed a residential neighborhood. A separate investigation by the California Public Utilities Commission, which was supposed to be monitoring PG&E and ensuring the company follow safety guidelines, found that PG&E illegally diverted $100 million away from pipeline safety and into the pockets of their executives. The sentencing judge appointed an independent monitor to ensure PG&E’s future compliance with safety rules because state regulators didn’t do their job. It’s that level of negligence and greed by the utility, and poor state oversight, that makes us worry about Diablo Canyon’s safety. Interestingly, PG&E and SLC want to strike from the upcoming trial any testimony about the San Bruno disaster. We think PG&E’s history of negligence, lying about safety, and criminal conviction are relevant to their operation of Diablo Canyon and the court should consider this when deciding whether Diablo Canyon should be exempt from an Environmental Impact Report. We contend the commission did not have the legal authority to exempt Diablo Canyon from an Environmental Impact Report, which is required under the California Environmental Quality Act. Studies show that substantial harm to people in adjacent communities and the marine ecosystem will occur in the eight years leading up to Diablo Canyon’s proposed closure in 2025 as the aging plant reactors become even more brittle. Studies cited in our lawsuit also show increasing rates of cancer and infant mortality in communities around the Diablo Canyon plant, which releases radioactive particles into the air. The plant is further at risk for an earthquake-induced Fukushima-like disaster. Studies by the U.S. Nuclear Regulatory Commission show that Diablo Canyon is the third most “embrittled” nuclear plant in America, and that by 2033 it will be a danger to operate. You have to wonder why PG&E is so opposed to an environmental review of this plant. What are they hiding? What information does PG&E think will be revealed by such a review? The public has a right to know. It’s a NUCLEAR plant, and even one small leak or accident could sicken or kill thousands of people and destroy the Central Coast’s economy. Judge Mary H. Strobel is hearing the case without a jury. We hope she will order the commission to void the lease extension and start the environmental review process. Diablo Canyon and its operators must be held to a higher standard of safety and accountability. Please support our efforts to make that happen.